To impeach or not to impeach: that is the question. A new book makes the argument for impeaching Donald Trump, the 45th president of the United States. There has been no shortage of commentary from the left and the right and those in the middle about whether or not our current president has committed any impeachable offenses. But what has been lacking is a clear cut opinion from a real impeachment expert—someone who has actually held public office and has participated in an impeachment hearing. The Case for Impeaching Trump breaks some new ground in that the author has true experience with impeachment. Elizabeth Holtzman served as a member of the House Judiciary Committee that voted to impeach Richard Nixon. The youngest member ever elected to Congress in 1973, Holtzman is no stranger to the legislative branch, having represented New York on the Hill for 42 years. Yes, she is known as a progressive, but also as a fair-minded progressive with a principled and persistent stance on the rule of law. She reminds us that the first article of impeachment against Nixon focused on his coverup of the Watergate burglary by impeding investigations into it and then she demonstrates how our current president has sought to quell the investigation into Russian behavior, first by firing FBI Director, James Comey, and then by attacking special counsel Robert Mueller. “While the full scope of President Trump’s efforts to impede the investigations into Russian interference in the 2016 presidential election is as yet undetermined “ she writes, “the standard for commencing an impeachment inquiry has been more than met.” In short, she finds that there is reason to believe that the Russia scandal is an example of Trump giving aid and comfort to an enemy of the United States. 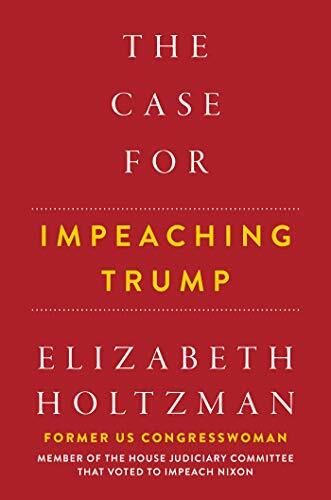 After the Russia exposition, Holtzman details other possible abuses by President Trump that she feels rise to the occasion for impeachment hearings—focusing on the president’s business dealings and holdings, campaign finance law violations, and possible high crimes and misdemeanors. For those with legal background, there is even an explanation of the emoluments clause. (She veers a bit off-course in the section on President Trump’s immigration policies—specifically his attempt at separating families at the border.) While it was a morally corrupt endeavor, it is not certain it would be part of an impeachment inquiry. The book gives you reason to think back and think ahead. There is a highly useful appendix in the book with the actual Articles of Impeachment against President Richard Nixon, which gives historical context to the argument. Holtzman is courageous in writing this book. It certainly won’t win her a White House invitation to the Christmas Party. Given the new Congress and a new year coming, this is a timely read. Tara D. Sonenshine is a former undersecretary of state for public diplomacy and public affairs. From 2009 to 2012 she served as Executive Vice-President at the U.S. Institute for Peace, has served in a variety of capacities in the White House including transition director of the national Security Council, and is currently Distinguished Fellow at George Washington' University's School of Media and Public Affairs where she works on Planet Forward, a consortium of schools addressing sustainability.